Samantha Kunin is the second FSU student in two years to earn the distinction of Rhodes Scholar finalist. Florida State University senior Samantha Kunin is an accomplished scholar, dedicated humanitarian and an avid rower. Those achievements put her on an exciting journey as a finalist for the Rhodes Scholarship this fall. Kunin, 20, interviewed Saturday in Birmingham, Alabama for the world’s oldest and most celebrated international fellowship award. While she was not one of the 32 U.S. college students selected for the Rhodes Scholarship this year, Kunin said the process invigorated her human rights work and research. An economics and international affairs major from Lakeland, Florida, Kunin is a member of FSU’s second cohort of Presidential Scholars — the university’s premier undergraduate merit scholarship program that invests in students with extraordinary potential to be the transformational leaders of their generation. Kunin’s quiet leadership and a phenomenal work ethic have earned her distinction among her peers since arriving on FSU’s campus four years ago. She starts her day by waking up at 4:30 a.m. for rowing practice and usually beats the faculty to the Honors, Scholars and Fellows Building each morning. “Ever since she stepped foot on campus, Sammie has striven to assist others to find their voice — be it immigrants through our dense legal system or other students through navigating the challenges of college independence,” said Craig Filar, associate dean of Undergraduate Studies and director of the Office of National Fellowships. The daughter of an immigrant mother from the Philippines, Kunin has made it her personal mission to create substantive change in the way the United States addresses immigration. Her interest in human rights and migration studies stems from life experiences. In high school, she traveled to Haiti, which sparked her curiosity about why extreme poverty exists and how it is perpetuated. That drew her to major in economics and international affairs, where she could explore causes and ways to alleviate those sorts of issues. But it was her first trip to a detention center in Texas after her freshman year of college that cemented her career path in public service. She spent part of the summer working for an immigration lawyer as an interpreter and legal assistant at the South Texas Family Residential Detention Center in Dilley, Texas, about 60 miles southwest of San Antonio. Kunin — fluent in Spanish — worked with women and children fleeing Central America, giving them a voice as she prepared them for their credible fear interviews with asylum officers. Since that first trip to Texas, she’s also worked as an interpreter for the Southern Poverty Law Center’s Southeast Immigrant Freedom Initiative in Lumpkin, Georgia. “These people are literally fleeing for their lives and just trying to protect their families,” she said. Those experiences have fueled her continuing work in the field and her commitment to improving the living conditions of detainees and asylum seekers. Kunin’s work at detention centers around the United States inspired her to reach out to refugees in the Tallahassee community. In 2016, she met with the Florida Department of Children and Families and refugee resettlement agency International Rescue Committee — the only refugee resettlement agency in the city — and found they were getting nonstop calls from teachers who didn’t know how to handle the influx of refugee students from Syria and the Congo. The effort resulted in Kunin co-founding the Migrant and Refugee Education Alliance (MREA), an FSU registered student organization that helps assist local migrants and refugees in learning English and successfully resettling into the community. “When you read any research about integration outcomes for refugees, the main thing that hinders them from gaining employment — which they need to integrate and provide a good standard of living for their family — is learning English,” Kunin said. A little more than a year since its founding, the organization maintains a schedule of more than 100 tutors at 16 different K-12 schools in Leon County to work with refugee students. Kunin has also been studying Arabic in an effort to develop skills she could use to help another large population. Last spring, Kunin was recognized for her work with MREA and the Southern Poverty Law Center with the FSU College of Social Sciences & Public Policy’s Humanitarian of the Year Award. 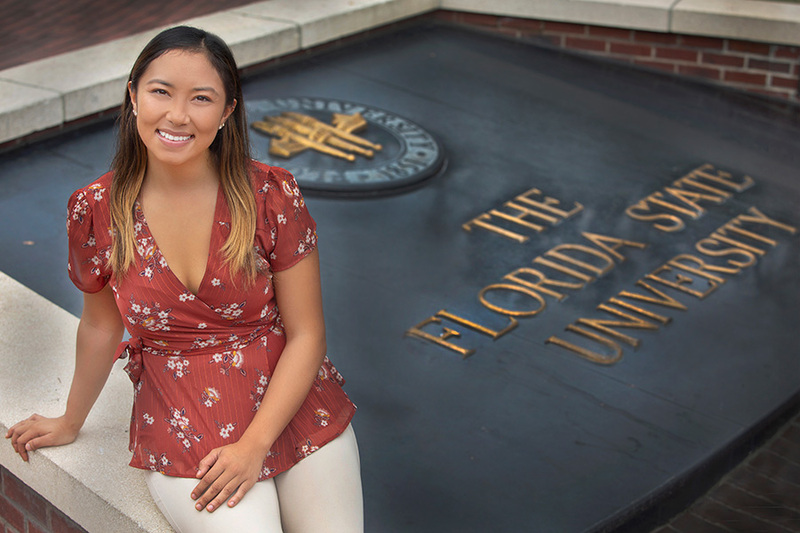 Kunin said classes at Florida State such as Refugee Protection Issues, plus FSU programs like Presidential Scholars, the Global Scholars Program and Undergraduate Research Opportunities Program, have been pivotal in shaping her research. Florida State has a total of five Rhodes Scholars: Frederick William Buchholtz, 1905; Caroline Alexander, 1976; Garrett Johnson, 2006; Joe O’Shea, 2008; and Myron Rolle, 2009. In addition, FSU had Rhodes Scholar finalists in 2009, 2011, 2012 and 2017. Rhodes Scholarships, created in 1902, are the oldest and among the most distinguished international fellowship awards in the world. Scholars are selected based on academic achievements, character, leadership qualities and commitment to others.